A new year usually means new goals and a clean slate. It's also a great time to get started with a few new healthy habits for yourself and your dog. 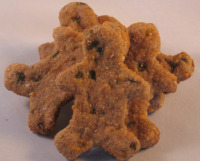 Green Bean Dog Biscuits with Beef Broth - Your dog won't know these are to help him lose weight. With the addition of cheese and beef broth, it's a treat he'll enjoy even after he sheds a couple pounds. These treats are loaded with fiber, vitamins and minerals. 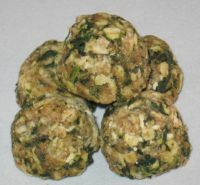 An entire cup of spinach is used to make these cheesy and flavorful treats. Schedule More Playtime - Life can get busy and we can overlook the important things. So schedule time with your dog. Extra play is not only a time for exercise, but also a time to bond with your dog. And your dog won't be the only one to benefit. Spending 30 minutes a day focusing on your dog will help lower your stress levels, too. Measure at Meal Time - Don't free feed your dog. Determine the proper amount to feed your dog on a daily basis and then measure it out. You'll be able to keep track of how much she's eating and it'll probably make your bag of food last longer, too. Take Inventory - At least once a year, check the quality of your dogs everyday items. What's the condition of her collar, leash, food bowls, toys, blankets, etc. If needed, replace the worn out items. 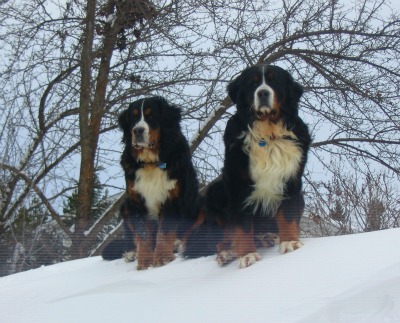 Daily Grooming - Depending on your dogs coat, daily or regular grooming is a must. Take a couple minutes at the end of the day to have some quite brushing time before bedtime. Make it an opportunity to bond with your dog. The act of brushing your dog is good for his coat as it dispenses oils from the skin to the fur. It's also a way to show love with extra pets and snuggles. Dog Saving Fund - Begin putting away a little each month for the unexpected. Having some money set aside makes everything from regular visits to the Vet, buying needed food and toys, to paying for unexpected health bills much easier. Simply hit reply to this newsletter, attach a photo and tell me a little about your plans for the new year. 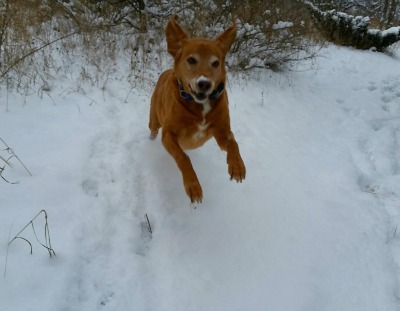 His Mom, Tammy said "We just got the first snow of the season this weekend and Koby was so excited to be out running in the woods - he certainly is a happy 9 year old puppy dog, as you can tell! We go for a walk everyday and then it's back to the house for a yummy homemade peanut butter dog treat, his favorite recipe!! After a fun time running thru the woods and fields, Koby does love to snuggle in his blanket, curled up on the couch next to his Momma during the cold northern Michigan winter evenings! There is nothing better than the love of a puppy dog, whatever the season!!" January is National Train Your Dog Month. Whether your dog is 10 months old, or 10 years old, there's something that he could be better trained to handle. They have free webinars and loads of helpful tips and resources to help your dog develop social skills, manners, and learn a new trick or two. "You have a great website with valuable information." "I am fairly new to your website, but I just wanted to say thank you for the wealth of information and recipes you share on your site. I have a five year old Aussie who is on a restrictive diet. As I make all of her food, your website is a great resource. I have been making your Sweet Potato Dog Chews for a couple months now and she loves them!